But she was another man. But she gets it while she can. 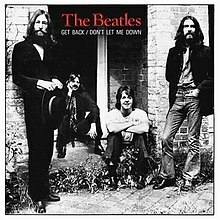 (1969) "The Ballad of John and Yoko"
"Get Back" is a song by the Beatles, originally released as a single on 11 April 1969 and credited to "the Beatles with Billy Preston." A different mix of the song later became the closing track of Let It Be (1970), which was the Beatles' last album released just after the group split. The single version was later issued on CD on the second disc of the Past Masters compilation. The single reached number one in the United Kingdom, the United States, Ireland, Canada, New Zealand, Australia, France, West Germany, and Mexico. It was the Beatles' only single that credited another artist at their request. "Get Back" was the Beatles' first single release in true stereo in the US. In the UK, the Beatles' singles remained monaural until the following release, "The Ballad of John and Yoko".